Sambar is a lentil based stew very popular in South India. Kerala Varutharacha Sambar is more or less similar to arachuvitta sambar except the way of preparation is slightly different. It is prepared with mixed vegetables and roasted coconut with spices. It goes well with both rice and idli, dosa. Today we will learn how to make Kerala Varutharacha Sambar following this easy recipe with step wise pictures. Soak tamarind in a cup of hot water. Extract the juice and discard the pulp. Chop all the vegetable into medium size pieces. Vegetables I used for this sambar - 1 Carrot, few pieces of pumpkin and ash gourd, drumstick, 1 brinjal, 1 small potato, 4-5 pieces of raw plantain (vazhaikkai) and 1 tomato. If using lady'sfinger, fry it separately and add it to the sambar in the end when adding the ground masala. Pressure cook dal with 1 cup of water and turmeric powder until soft. Mash it well. Heat 2 tsp of oil, add bengal gram, urad dal, fenugreek seeds, when dal starts to change color, add coriander seeds, red chillies and hing. Saute for a few minutes and then add grated coconut, pearl onions and curry leaves. Saute until coconut turns light golden brown on low flame. After it cools, grind it to a smooth paste and keep it aside. Our sambar masala paste is ready. Take a pressure cooker, add the cooked dal and all the vegetables except tomatoes along with little water. Pressure cook for 1 whistle. Alternatively, you can cook the vegetables separately and add to the dal, if you do not have a pressure cooker. Once the pressure subsides, open the cooker, add the ground masala paste, chopped tomatoes and tamarind water. Simmer and cook on medium low flame for 15-20 minutes or until the raw smell of the tamarind goes. Keep stirring now and then, to prevent the dal from sticking to the bottom of the pan. 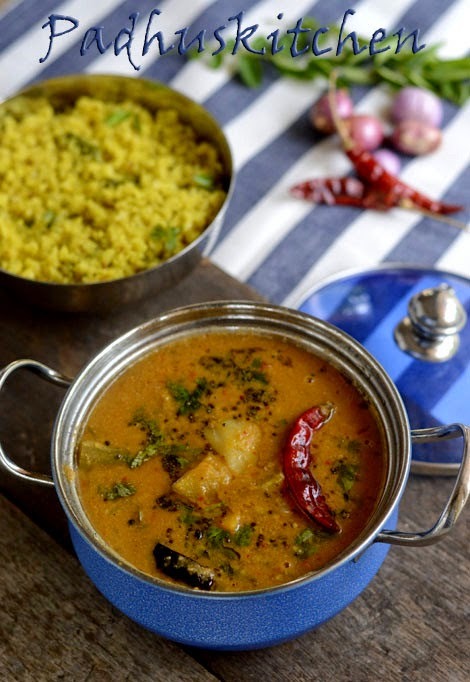 You can adjust the consistency of the sambar by adding water as per your personal preferences. The sambar must not be too thick nor too thin. Heat oil, add mustard seeds, when it splutters, add red chillies and curry leaves, saute for 2 seconds and pour it over the sambar. Garnish with finely chopped coriander leaves and serve it with hot steamed rice. Dont we need to allow the tamarind solution boil for sometime alone till raw smell goes. Are are supposed to add dhal , tamarind solution and cooked veg together and boil. If you boil everything together well on medium heat, the raw smell will go off. Kerala sambar is done in this method. Red chilli means dried red chilli or fresh chilli. In the picture I saw dried chilli but your receipe say red chilli. Don't confuse please. Thank you. Grateful for the good receipe. Thanks sima. If I mention red chilli, it is dry red chilli only unless otherwise mentioned. I have kept only dry red chillies in the pictures as you can see. Thank you very much. Tried out the recipe .. it came out excellent ! If we are cooking vegetables in a separate bowl with dhal in cooker should we pour water to vegetable bowl? Not necessary as if you add water, the vegetables will get over cooked. If required, you can sprinkle a little water.